Security Cameras Without WiFi: What Are Your Options? There are so many security cameras on the market today, but most of them work with WiFi. So what happens when a homeowner is in an area where that’s not available? What if they simply don’t want to use it? Also, what is the best home camera to use? Fortunately, there are options for their security system. 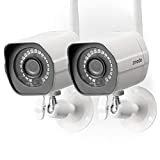 While WiFi is the most commonly used way to have security cameras, it’s certainly not the only way for a person to have the kind of camera they need to have peace of mind and protection. There are other types of security cameras — including those that can be hardwired into a home — that will provide that peace of mind, as well. The level of protection a homeowner will get with a hardwired camera is essentially the same as what they’ll get with WiFi. The options for accessing the camera and its footage may be a little bit different, and they may not be able to use it with a smartphone app, but that doesn’t mean they can’t get any access to it at all. While it’s generally better to have a WiFi home security camera, there are some other options, as well. There are WiFi cameras that generate their own signal, so additional WiFi isn’t needed. There are also some that don’t use WiFi at all. The only problem with that is that they don’t allow a homeowner to access them from something like a smartphone, or remotely. They have to be accessed from their location, in a certain way. That can be fine for looking at footage later, but it’s not good for seeing what’s going on in the moment. Any homeowner who wants to be able to see their camera’s footage or view remotely from their smartphone in real time, for example, will need a standard WiFi security camera. With the right kind of company behind a security system, there are options. There are also choices for homeowners who are building their own systems, and who aren’t relying on companies to create, install, or potentially even monitor those systems. This isn’t always the right choice for everyone, but for some homeowners it can be an excellent choice to pick an HD security camera that doesn’t have WiFi and a system that they can monitor or that they aren’t locked into a contract on. That can really add to peace of mind if it’s what the homeowner’s specifically looking for. There are many companies offering those things and more, but a homeowner will have to decide which company they want to work with or whether they would prefer to do things on their own. Home security and automation have come a long way, and they have a lot more to offer today than they did in the past.